Leading the development of inclusive sport and active recreation for children, young people and adults with a physical, sensory or learning disability across Fife. Disability Sport Fife and parent body Scottish Disability Sport organise a series of workshops / courses in Fife throughout the year in addition to those provided by Active Fife and SDS nationally. Within this section you’ll find links to download the most recent results from competitions and events. If you are looking for results from years previous please contact the DSF office. Disability Sport Fife has supported over 20 members to become GB Summer or Winter Paralympians since 1977. DSF athlete members have been enormously successful in European, World Championships plus Paralympic Games. Sessions for athletes with a disability. Physical and sensory impaired athletes only. Core sports skills coaching session for children and young people with a physical or visual impairment. Short tennis, table tennis and basketball coaching sessions for players with a disability. Coaching session for players with a disability. Intermediate and advanced swimmers with a disability. Adult learners with additional support needs. Gym session for teenagers and adults with learning disability. Coach led session for players with a physical, sensory or learning disability including those who use a wheelchair. Disability Sport Fife (DSF) was established in 1977. In 2017 we celebrated 40 years as the disability sport lead body in Fife for children, athletes and players of all ages and abilities with a physical, sensory or learning disability. DSF athlete members have been successful in European Championships, World Championships and Paralympic Games all over the world. Since 1977 we have supported 25 DSF members to become GB Paralympians. Our individual members and teams have enjoyed enormous success in Scottish national events across all sports. Each year we organise an extensive programme of sports events and provide education and training opportunities for coaches, volunteers and peer mentors. DSF employs an experienced team of coaches on a session by session basis to deliver sports specific and active recreation sessions weekly across Fife. DSF has a part time administrator based at the Michael Woods Sports and Leisure Centre financially supported by a Fife Council grant. DSF has a Service Level Agreement with Fife Sports and Leisure Trust and works in partnership with Active Fife. In addition to the General Management Committee DSF has a number of sub committees with responsibility for Finance, Policy, Performance Sport and Safeguarding in Sport. DSF established a Hall of Fame to recognise performance athletes who have achieved significant success in international disability sport. The DSF Annual General Meeting and Awards Evening is now a significant occasion in the Fife Sporting Year with almost 100 attendees. We also have strong links with Fife schools and the Active Schools Network. Since its formation we have worked closely with Health and Social Care in Fife and a significant number of Fife Sports Clubs. 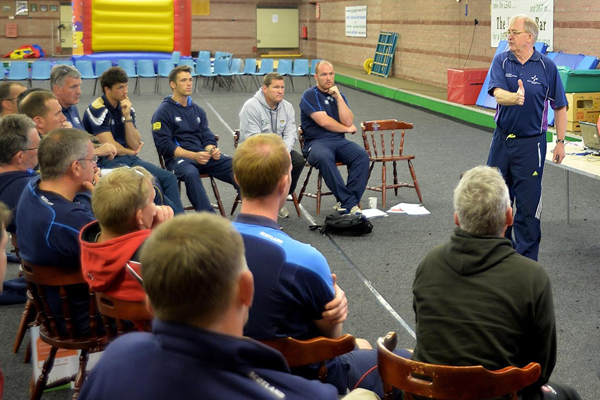 DSF considers the Sports Councils in East, Central and West Fife as key partners. DSF also recognises the four activity options which are the foundations of the SIM. Modified activity everyone engaged in the same activity with modifications that offer challenge and support for participants of all levels of ability. Disability sport specific activity an individual or group is engaged in a unique activity specific to disability sport. Please note sometimes there is a restriction on who can attend but in most instances they are open to all interested parties. Click the links below to download the latest competition and events results. Disability Sport Fife has supported 25 members to become GB Summer or Winter Paralympians since the movement was formed in 1977. DSF athlete members have been enormously successful in European, World Championships plus Paralympic Games. DSF as established a Fife Hall of Fame to celebrate the achievements of great athletes and players from Fife. Six DSF members were among the first 20 Scots inducted into the Scottish Disability Sport Hall of Fame in 2012. DSF is proud to support the Fife Futures squad of high performance athletes with Paralympic or Para-sport potential. Profiles of some of the squad members appear below. Fife’s first high performance boccia player, Kieran Steer, from Crossgates continues to blossom as a high performance boccia player. Kieran’s recent outstanding gold medal performance at the World Junior Para-Sport Games in Brazil has made him even more determined to continue to improve as a world class player. Boccia rankings have recently been released and Kieran is ranked 3 in the BC4 class pairs and 37 in the BC4 class individual rankings. The young Fife player is delighted with the progress he has made in his short career in international sport. Kieran’s main focus is to qualify for Team GB for the Paralympic Games in Rio in 2016. His first milestone was to gain selection for the GB Paralympic Squad and this he successfully achieved in 2013. A 2014 target includes challenging for a place in Team GB for the World Championships in Beijing in August. Other milestones in 2014 for the young student are to gain selection for Team GB for major competitions in Portugal and Canada. In 2014 Kieran hopes that he can improve on his best performances to date at the Scottish and GB Championships which at the moment stand at fourth place. Much of Kieran’s training is held at the Peak in Stirling plus Crossgates Community Centre in his home village. With support from the Fife Sports and Leisure Trust and a his Gold card Kieran makes use of the new Michael Woods Centre for gym training where he is delighted with the support he has received from the fitness staff. Having his GB coach Claire Morrison in Dalgety Bay helps enormously and he now manages to balance regular training with college commitments. Attending Fife College on a Creative Technologies ICT course is hugely important to the young player and he hopes to pass his NQ followed by NC and HND. Apart from a massive commitment to boccia, and of course his studies, Kieran like so many teenagers has a wide range of music interests which helps enormously to cope with the pressures of high performance sport. Behind every successful performance athlete is a committed support team and Kieran is well supported by his family. Strong family support is critical to performance player success and Kieran has had that in abundance since he started out on the boccia pathway at the Fife Sports Institute. Kieran is a Scottish Disability Sport Academy athlete as well as being supported by UK Sport through GB Boccia. Winter training is hugely important to performance athletes and equally so for performance athletes with a disability. Under the guidance of coach, Gemma Nicol, Scotland’s leading middle distance athlete with a learning disability, Owen Miller, has started 2014 in a way that he hopes will continue through into the outdoor season and for the remainder of the year. During the winter the young Dunfermline Track and Field athlete competed in a number of cross country events over eight and nine kms. and then travelled to the Emirates Arena in Glasgow for Scotland’s two major indoor meets of the year. At the Scottish Indoor Senior Championships, Owen recorded a personal best of 4:02.20 for 1500m which also betters his lifetime best outdoors. 2014 will be a very important year for the young Dunfermline athlete. Missing out on the 2012 Paralympic Games in London was disappointing but Owen committed totally to every event last year and both he and coach Gemma were pleased with his 2013 season. At the moment Owen is waiting for the announcement of the Great Britain team for the European Championships in the Netherlands from 11-15 June following his nomination by Disability Sport Fife supported by Scottish Disability Sport. If selected Owen will target the 1500m and hopefully will be offered a run in the 4 x 400m relay. The 2014 athletics season could turn out even better if he gets a chance to challenge for a place in the Great Britain team for the IPC Championships in Swansea in the summer. Consideration for a GB place would only result from improvement in his 1500m time outdoors in key events. Owen is a past pupil of Woodmill High School where he was introduced to Disability Sport Fife by his PE teacher and supported by the staff in the department for pupils with additional support needs. With support from Dunfermline Track and Field club athletes and coaches he has blossomed as an ambassador for Fife and a role model for young athletes with a learning disability throughout the country. Throughout his career Owen has been massively supported by his family including his mum, grandparents and brothers and sisters. Owen’s training costs are supported by the Fife Disabled Sports Trust, Fife Sports and Leisure Trust, the Scottish Disability Sport Academy and British Athletics. Disability Sport Fife (DSF) has a long tradition of identifying and supporting performance swimmers with a physical, sensory or learning disability. 16 year old Craig Smith from Glenrothes is a member of FINS and a pupil at Glenrothes High School and the first physically disabled swimmer from the town to follow in the footsteps of great swimming ambassadors and Paralympians like Paul Noble, Lara Ferguson or Andrew Lindsay. Paul and Lara attended Glenwood HS and Andrew Glenrothes HS and all are members of the Disability Sport Fife Hall of Fame. Craig was nine and a pupil at Rimbleton Primary School when he was taught to swim by PE teacher Colin McGinlay at the Fife Sports Institute staff and thereafter he progressed to the Fife Sports and Leisure Trust coach session led by Anna Tizzard in Glenrothes. In December 2011 Craig joined FINS and came under the influence of club coaches Graham Irvine and Ian Lewis. Membership of the Fife Performance Squad followed and Craig subsequently increased his swim training session to seven per week plus a couple of fitness sessions. As a young person with cerebral palsy, Craig is the first person to acknowledge the incredible support he has received throughout his life from the NHS Fife physiotherapy team and in particular Joyce Cummings and Christine Erskine. Craig and his parents believe that he has had access to the most appropriate physiotherapy advice at every stage of his development because of his challenges with range of movement, strength and flexibility. Before and after surgery in particular the NHS Fife physiotherapy team has been proactive. Two years ago Craig experienced the disappointment of receiving a classification that was higher than expected. Undaunted, the determined young teenager committed to training with increased fervor and late last year with support from Disability Sport Fife and Scottish Swimming he went through a classification review. The outcome was positive and Craig now swims in the S8 class and this has opened up improved competition opportunities. At the British Senior Short Course Championships in November 2013 he won a bronze medal in 50m freestyle. Qualification for the UK School Games in London and Sheffield were occasions that Craig remembers with great fondness and he is looking forward to competing in a British Gas mainstream swimming championships in Glasgow in April this year. Craig has only recently recently returned from the 2014 British Junior Championships at Ponds Forge in Sheffield where he won his first British title in the 400m freestyle. He followed this landmark performance with a bronze medal in 100m freestyle and was proud to be part of the Scottish relay team that won a silver medal. Like so many other talented young sports people Craig is a sports fanatic with an ambition to represent Scotland and Great Britain one day at the highest level in disability sport. Craig’s commitment to training and competition are exactly what is expected of a high performance swimmer and those who have observed his progress over the past seven years are confident that one day he will follow in the footsteps of Fife’s great disability swimmers of the past. Anster Haddie, Derek Rae, from Kirkcaldy will face the biggest challenge in his athletics career to date when he travels south for the London Marathon on Sunday 18 April. Since becoming a member of Disability Sport Fife and carving out a career in disability athletics, as well as mainstream athletics, Derek has gone from strength to strength. Late last year he decided to ask Ron Morrison from St Andrews for coaching advice and support and he has not looked back since. Ron is aided by Don Macgregor (7th in the 1972 Olympic marathon in Munich) in their Fife AC and St Andrews University group. Despite losing a significant amount of winter training time through a foot injury Derek has produced quality times in the three events identified by coach Ron so far this year. The first event was the Scottish Cross Country Championships in Falkirk in February. Running over the 12 kilometre course for the fourth time, Derek finished in 45.06 to record a personal best time by 1.37. On 1 March Derek competed in the Cupar 5 miles for the first time and turned in a time of 26.57. On 16 March Derek finished 13th at the Alloa Half Marathon in a time of 1:14.52, a personal best by 1.40. Derek’s finishing time of 13th was an 18 place improvement on his previous performance. Prior to tapering for the London event, Derek will have a 3 hour weekend run at the end of March. Since his motor cycle accident and sustaining a brachial plexus injury, which necessitates him running with his arm in a sling, Derek has improved in many different ways as one of Britain’s leading physically disabled T46 marathon runners. Derek travels to St Andrews for training once a week with Ron and then follows his training programme in venues throughout Fife including the track at the new Sports and Leisure Centre in Glenrothes. The Fife athlete will start in the red start zone, “fast good for age” in his first London marathon, following an outstanding run in the 2013 Edinburgh marathon of 2:52.55. Derek will remember with great fondness the members of the Reelers Ball Committee in East Fife who assisted financially with his travel and accommodation. Derek is one of the most popular athletes within the DSF programme and will travel to London with his partner Susan. The London marathon is a very special occasion for performance distance athletes who are fortunate to make the standard and gain entry. There is no more deserving participant than Derek Rae and all who know him in Fife will be cheering him all the way as he attempts to make his mark in one of the most prestigious events in world sport. One of Disability Sport Fife’s (DSF) most popular and outstanding athlete ambassadors, Adam Morley, turned 50 on 28 November 2013. Fellow athletes, friends, family and Leisure Trust customers who know him as the telephone operator at the Fife Sports Institute and the Michael Woods Centre came together to celebrate the great occasion. Although born in England, Adam has spent most of his life in Scotland. Initially Adam lived in St Andrews but now he is well settled in Glenrothes where he has contributed significantly to the development of disability sport in Fife. Adam attended Graysmill School in Edinburgh before registering as a College student in Fife. Adam’s first post was at the Fife Sports Institute where he has influenced so many individuals with whom he has come in contact. While living in the east of Fife Adam travelled regularly to Glenrothes for training. Eventually he moved to Glenrothes and after a short career as an international power lifter in the mid 80s he committed himself totally to the sport of swimming. 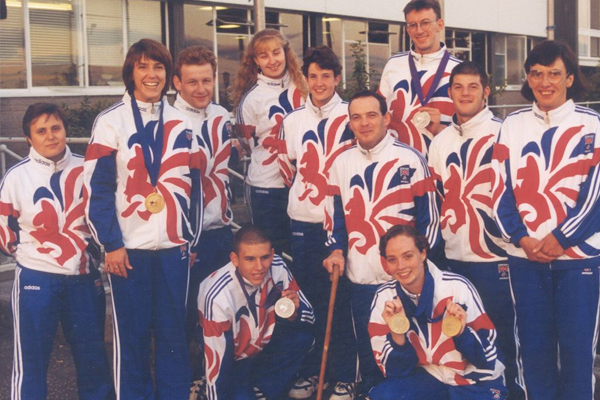 Success at local and national level led to his selection for Team GB for the Paralympic Games in Seoul in 1988, Barcelona in 1992 and Atlanta in 1996. Adam offered so much more to Scottish and GB teams than simply his swimming ability. Rarely without a smile, always available to chat and one of these special people who goes through life without an enemy but many friends. An exceptional sportsman and a wonderful ambassador for family and disability sport locally and nationally. Adam’s interests are many and varied. He has put so much back into disability sport as a long serving member of the DSF Management Committee. He no longer competes but continues to swim for fitness and spends large amounts of his leisure time listening to music and pursuing his many interests. Adam’s range of leisure pursuits are extensive and his knowledge on a whole range of subjects make him a very active and successful member of his local quiz team. Brad Stewart from Ladybank continues his progress to gain selection for the Great Britain disability archery team. Brad is a member of the GB Confirmation Squad and recently recorded impressive performances at the B.W.A.A 9th International Invitation Event and National Championships at Stoke Mandeville. In the national Championships he won a bronze medal in the W2 class for recurve archers and finished in 5th place overall in the international event that involved archers from Ukraine, Malaysia, Brazil, Norway, Poland, Switzerland and Azerbaijan. Brad is currently the leading Scottish archer in his class. High performance archery is extremely demanding and very costly in terms of equipment and travel. As well as travelling south of the Border to training, the Disability Sport Fife (DSF) Futures Squad member travels across to the Central area to meet up with his Scottish coaching team of Hazel and Murray Elliot. Brad also shoots with Cupar Bowmen and where possible trains and competes in venues throughout the country. During the past few months he was voted disabled athlete of the Year by the St Andrews Kilrymont Rotary Club and was also awarded the Bill Pullar Bursary for 2013. Brad is a very talented high performance sportsman whom we are certain will achieve his dream of GB selection one day. Tracy is Scotland’s most successful sports person with a learning disability, winning a total of 39 medals in swimming at Paralympic, World or European level. Tracy was a pupil at Balwearie High School and initially swam with Burntisland Swimming Club before moving to join a very strong squad of Paralympians to be coached by Eddie Campbell at Glenrothes Swimming Club. Tracy completely transformed attitudes to S14 swimming in Scotland and Great Britain during the 90s. Tracy’s record in World Championship swimming was exceptional and is unlikely ever to be bettered. Tracey won 9 medals in total of which 6 were gold at the World championships of 1994 and 1998. Between 1995 and 2001 at four successive European Championships, Tracy won 25 medals of which 22 were gold. It was in Atlanta in 1996 that Tracy was at the peak of her form. Her 2 gold medals were confirmation that she was the leading S14 swimmer in the world at the time, and just reward for years of dedication to her sport. One silver and 2 bronze medals followed in Sydney in the Games that ended the involvement of athletes with a learning disability in Paralympic sport. The head to heads that Tracy had during her spell at the top with the great swimmers in her class from Australia and Scandinavia were memorable and she gained herself the reputation as the high performance swimmer for the big occasion. Britain’s attitude to S14 women’s swimming changed when Tracy Wiscombe arrived on the scene and she was a sad loss to Scotland when she moved south of the Border and an even greater loss to Great Britain when she retired after Sydney. Tracy was a Paralympic swimmer from Fife who was fully included in mainstream swimming and excelled in both disability swimming and mainstream swimming locally and nationally. The pathway she followed from school to club to GB selection was the model for any individual with a learning disability. Tracy remains a role model in her home area for successive generations of performance athletes with a learning disability across all sports. Paul competed in 5 successive Paralympic Games winning a total of 15 Paralympic medals including four golds. In each Games he won at least one medal in a Parlympic career that ran from 1984 until Sydney 2000. Paul became involved in disability swimming as a pupil at Glenwood High School in Glenrothes. Brittle bones (osteogenesis imperfecta) caused him considerable inconvenience as a high school pupil because of the many breaks he had to deal with. Undaunted by successive periods in plaster, he spent many a lunch hour developing his swimming skills or improving his ability as a representative school table tennis player. In each of these sports he established himself as the number one in Scotland. Many a battle he had at the National Championships with George Keith from Aberdeen and on a number of occasions he won the National singles and doubles titles partnered by fellow Fife Paralympian Lara Ferguson. Paul also won 6 medals in world championships between 1986 and 1998 and 8 European Championship medals in 1991 and 1997. Paul is a past GB Team Captain and was a key member of the British team throughout the 80's and 90's and is known for his ability to turn out a top performance on the big occasion. As a relay team member he has an exceptional track record. For almost 20 years he was a member of Glenrothes Swimming Club and held every Scottish disability swimming Men's Open Record. Drew Young and Eddie Campbell were club coaches who supported Paul throughout his career. Paul was recognised for his contribution to swimming by the award of the MBE and he still gives so much of his leisure time back to disability sport as the Chairman of Disability Sport Fife. Paul is an accountant with Fife Council and is the SDS national swimming records keeper. Paul has made a name for himself as an announcer at international disability swimming events and was on duty at the Olympic pool during the 2012 Paralympic Games. Paul is a model sportsman in every way who has achieved so much and continues to offer so much to the development of disability sport. During his time at top Paul was totally committed to his club, local Branch and country and gained a reputation as a fierce opponent at home and overseas. Caroline (nee Innes) was a pupil at Bell Baxter High School in Fife and began her sporting career as a swimmer with Cupar and District Swimming Club. Caroline’s early coaching was provided by her local swimming club. Fife AC then helped to launch her career as one of the outstanding British sprinters of all time. Introduced to disability sport by Disability Sport Fife, Caroline’s first representative honour came as a member of the Scottish Junior Squad that competed in the British Junior Swimming Championships at Stoke Mandeville. She was encouraged to try athletics and very quickly it was evident this was where she would excel. Caroline’s first major representative honour came as a member of the Scottish Youth Team that travelled to the World Games in Miami in 1989. It was obvious at that event she had international potential as a sprinter. Caroline launched herself into sprint training thereafter and athletics quickly became a way of life. Major representative honours then followed. Caroline won 5 Paralympic medals of which 4 were gold. Her first Paralympic selection was Barcelona in 1992 and she returned with a gold medal. Further honours and medals followed in Atlanta and Sydney. She also won gold at the World Championships in Berlin in '94 and Birmingham in '98. For over a decade Caroline was recognised as the world's leading sprinter in the T36 Class. She achieved times and set standards that had never been envisaged for a T36 athlete with cerebral palsy. Caroline was a true superstar of women's athletics. She pushed the boundaries and raised the standards in her class under the guidance of coach, John Oulton. Caroline was an incredibly determined athlete who challenged perceptions and broke down so many barriers in sprinting for athletes with cerebral palsy. Scottish Athletics and Scottish Disability Sport recognised her contribution to disability athletics by awarding her major accolades and awards. Caroline, husband John, and her two daughters live in Carnoustie. Caroline still serves as a member of the Disability Sport Fife management committee and is a past Chieftan of Cupar Highland Games. Colin was educated at Queen Anne HS in Dunfermline and introduced to Disability Sport Fife by school support staff. Colin first made his mark as a swimmer, like so many other young disabled sports people, but it was clear early on that his international future lay in track athletics. During the 80s he was the outstanding T36 sprinter in the world and won 5 gold and 1 silver medals at the Paralympic Games in New York and Seoul. Colin raised the standard in his class during his time at the top and became a hugely respected international athlete. He was an excellent cross country runner and medalled at Paralympic, World and European level. Colin was the leading T36 athlete on the track during the 80s and he was instrumental in raising standards in the class during his relatively short but illustrious career. Colin was the first DSF member to be coached in a mainstream athletics club. Fife AC must be congratulated for its vision and for adopting the inclusion model before it been identified as the way forward. Coach Eric Simpson was the inclusive coach who provided outstanding support for Colin during his decade as the lead athlete in his class in the world. Colin’s impairment was cerebral palsy but he had secondary sensory challenges of deafness, epilepsy and absence of speech. These challenges were worked through by athlete and coach with massive support from Colin’s late father Bill. The support offered by his family throughout his competition years was exceptional and critical to his success. Colin’s outstanding achievements came in 400 metres but he also excelled in the shorter sprints. Memorable images from New York and Seoul will always be his tenacious cross country successes. Colin was an automatic Scotland and GB pick during the 80s. During his career Colin had many outstanding races against his GB team mate from Bishopbriggs Gordon Robertson. For a period they were ranked numbers one and two in the world in the T36 class. In Colin Keay and Caroline Baird, Fife and Scotland produced the two most talented and exciting T36 sprinters of the 80s and 90s. Each was introduced to Disability Sport Fife as a school pupil by family or school support staff. Each started out in swimming and most importantly very early on in their careers pursued an inclusive pathway with guidance from two excellent inclusive coaches. Both athletes broke down many barriers and gained the respect of everybody in Fife athletics and Scottish Athletics in general at the time. Andrew first became involved in competitive disability swimming through Disability Sport Fife when a pupil at Glenrothes High School. At the first gala he entered it was clear he had no shortage of energy, a considerable degree of skill and a tremendous determination to win every race he would enter. Perpetual motion is a phrase that has often been used to describe Andrew, and there is no doubt that he was a swimmer of excellence and a class performer on the big occasion. The first international honour for Andrew was selection for the Scottish team that participated in the European Schools Games in Lisbon in 1994. Selection came as a consequence of several outstanding performances with the Scottish Junior Swim Team at the British championships. Andrew won 17 medals at Paralympic, World or European Championships and for 10 years was undefeated in 100 metres backstroke in the S7 class. Between 1996 and 2008 Andrew won 3 Paralympic medals of which 2 were gold. At three World Championships between 1998 and 2006 he won 4 medals of which 3 were gold. His record in European Championships between 1996 and 2008 is exceptional, winning 10 medals including 5 gold. Andrew competed at the World Championships in South Africa in 2006 and protected his world record. Unfortunately Andrew just missed out on a medal in his final Paralympic Games in Beijing in 2008 when he finished in fourth place. Andrew was a member of INCAS swimming club where he was coached by Garrie Roberts but latterly was coached at the National Academy in Stirling by Anthony Stickland. Andrew identifies Steve Redgrave and his family as major influences in his life and those who know his mum and dad appreciate exactly why he singled out his parents for special mention. Andrew has served Fife, Scotland and Great Britain well and remains one of the most successful high performance international Scottish swimmers and one of the first to fully benefit from services provided by the Scottish Institute of Sport. You always expect the unexpected when you are with Andrew but there is no doubt he was an exceptional backstroke swimmer. Now married to Katie, (nee Haining) another of Scotland’s very successful physically disabled swimmers, the Lindsay’s have settled in Cowdenbeath. Aileen Harper was one of the first Fife female wheelchair athletes to make an impact in International sport. In the late 70's and early 80's she lived in Auchtermuchty. Aileen enjoyed considerable success in the sports of archery, athletics, swimming and wheelchair dancing. She was the only Fife athlete selected to compete for Scotland at the World Games in Holland in 1980. The Paralympic Games in New York in 1984 was her finest hour when she won 3 gold medals in track, field and wheelchair slalom. The quality of the slalom chair she had at her disposal was inferior to those of the athletes from United States and Denmark where the equipment was much more sophisticated. Despite this challenge Aileen came out on top by determination, concentration and no shortage of skill. Aileen retired after New York to settle down with her family in Glenrothes. Her contribution to the development of women's wheelchair sport in Scotland is immeasurable. Aileen passed away in March 2007. In the 80's when Scottish athletes with cerebral palsy were making their mark in International sport, Maxwell McKay from Cardenden was up there with the very best. Maxwell started his swimming career at Cardenden Swimming Club and was introduced to disability sport by his Physical Education teacher, Bob Gauld. Maxwell was selected for the Great Britain team for the Paralympic Games in New York in 1984. A silver medal in the 50 metres backstroke was his reward for a lifetime commitment to swimming. It was a performance at the time that had British spectators on their feet. Maxwell had an illustrious career in Scottish, British and international CPISRA swimming. Maxwell will always be remembered as one of the "real characters" within Scottish and British teams. He will also be remembered as an exceptional backstroke swimmer. ​Kerry from Dunfermline competed for Scotland in CPISRA events throughout Europe during the 80s. Kerry’s classification was CP1 and she used a power wheelchair. At the Paralympic games in Seoul she won gold, silver and bronze medals in throwing events and slalom. Kerry also excelled at the World Youth Games in Miami in 1989 as a member of Team Scotland. Kerry’s skill and determination were exceptional and she was the first British woman to take on the Americans and Scandinavians in sports they dominated and come out on top. Kerry has the minimum amount of movement yet she undertook some of the most incredible physical challenges. Her sub aqua dive in the river Tay being one of the most exceptional episodes in her sporting career. A unique athlete in every way and one of Scotland’s greatest ever athletes with a severe physical impairment. Willie McQueen from Inverkeithing was the most famous member of the long running swimming club for disabled people at Inverkeithing HS community use. In the late 80s and early 90s Willie broke into the Scottish CP swim team and performed brilliantly at CPISRA European and World championships. Selection for the Paralympic games in Barcelona followed and he took full advantage of the opportunity by winning gold and bronze medals in the pool. Willie is a past world record holder in his swimming class. Recognised as a specialist backstroke swimmer, Willie will always be remembered as the most successful of many disabled swimmers coached by Jean Wilson at the Inverkeithing HS club for disabled swimmers. Ian from Glenrothes was a member of the Fins Swimming Club and was coached by Ken White. He arrived on the sporting scene in the late 80's and his early representative honours were as a member of the Scottish Junior and Senior Swim Squads. Iain was a great success as a member of Team Scotland at the World Youth Games in Miami in 1989. Iain’s finest achievement was at the Paralympic Games in Barcelona in 1992. Originally Iain was selected for the Great Britain team to swim breaststroke in the GB medley relay team. Iain however was an unexpected qualifier for the 100 metres breaststroke final. Iain swam the race of his life in the final and finished ahead of his more experienced and much bigger opponents. Iain continued to represent Great Britain during the 90's and is one of very few Scots to compete at the Commonwealth Games in the EAD events. One of the most likeable and talented Fife swimmers ever. Pauline from Buckhaven came to the attention of DSF while a pupil at Buckhaven HS. Like so many Scots she started her career as a swimmer and then moved to table tennis before settling in athletics. Track changed to throws and it was in the javelin that Pauline found real success. Before being selected for GB Pauline made her mark in CPISRA and IPC Athletics World and European championships. Pauline was selected for the Games in Sydney and Athens and it was in Australia that she won silver in the F37 javelin. Pauline was one of the first beneficiaries of the Scottish Institute of Sport and the many services it offered to high performance athletes. Billy from Cowdenbeath is one of Scotland’s leading bowlers with a physical disability and 2014 could be his most important year to date as he challenges for a place in Team Scotland for Para-Sport bowls at the Commonwealth Games in Glasgow. Year after year Billy has excelled in carpet bowls and lawn bowls at the Disability Sport Fife Championships and the Scottish Championships organised by Scottish Disability Sport. Billy has also enjoyed considerable success in the past in darts, pool and snooker, winning national titles along the way. Billy is an established member of the Scottish Disability Sport bowls squad that is preparing for Glasgow 2014. In preparation for the Games, Billy was selected for the Scottish ‘A’ team to contest the 4 Nations Mens Triples for physically disabled bowlers at Kelvingrove in Glasgow in the summer of 2013. Kelvingrove is the venue for all bowls competitions at the Commonwealth Games. Later in the summer Billy was selected for the Team Scotland Scotland “A” Team for the 8 Nations Invitation competition which also was a preparation event for the Games of 2014. ​In each instance Scotland’s ‘A’ team won the team gold medal. This of course has enhanced his selection potential for the Commonwealth Games in 2014. Billy Allan is a member of Cowdenbeath Bowling Club and has represented Scotland in three World Championships overseas and numerous Home Internationals. 2013 was his most successful year to date but 2014 could be even better if he is selected and Team Scotland maintains its form of 2013. Scotland’s Para-Sport bowlers will be attempting to defend the triples gold medal, last won at the Commonwealth Games in Manchester in 2002. Maria from Dunfermline is one of the world’s leading visually impaired bowlers and is the current world champion in the B4 class, a title she won at the most recent World Championships in South Africa. Scottish Association of Blind Bowlers Championships – bronze medal in the B3 class. Maria is one of the most recent additions to Disability Sport Fife’s high performance bowls squad and within a short period of time she has recorded many outstanding performances. Maria has established herself as one of the most successful visually impaired bowlers from Fife ever. Maria is a member of the Scottish disability bowls squad and throughout the year has been challenging for a place in the Para-Sport visually impaired bowls squad for Glasgow 2014 where Scotland is exceptionally strong. Teenager Lucy Walkup from Glenrothes and Carnegie Swimming Club is coached by John Szaranek. In 2013 she achieved the highest level in deaf swimming by being selected to compete for GB at her first Deaflympics in Sofia, Bulgaria. Swimmers from 42 countries participated and the 17 year old was one of the youngest participants. In her six events Lucy set four new Scottish records and achieved a 6th and 7th place finishing position in 100m and 200m breaststroke. International deaf swimming is among the most competitive in world disability sport and Lucy’s achievements in her first Deaflympics were exceptional. At the British Junior Championships, Sheffield in March competing for Team Scotland, Lucy participated in six individual events winning two gold and four bronze medals. In addition she recorded four personal best performances and set a new British 100m breaststroke record of 1:17.21. In addition Lucy won three relay gold medals. In April Lucy swam in the British International Disability Swimming Championships in Sheffield and made the finals in all her four events, setting a new British 100m butterfly long course record of 1:12.24. In June she continued her outstanding year with three gold and two silver medals at the GB Deaf Championships in Loughborough. In November Lucy competed at the British Senior Short Course Championships in six events winning one gold, two silvers and three bronze medals plus three relay gold medals. Lucy’s outstanding swim at this meet was a deaf world record swim of 1:16.45 for 100m breaststroke. Domestically Lucy set three deaf world short course records at the Scottish Open National Championships at the Royal Commonwealth Pool at the end of the year. Lucy is a member of the Scottish Youth Development Squad and her fantastic competition year came to an end at the Scottish National Short Course Age Group Championships in December where Lucy set three new age group world records in the S15 classification in 50m, 100m and 200m breaststroke, improving on her 100m world record set in November. The icing on the cake for the young Fife swimmer was to learn at the GB Training Camp in Liverpool in December she has been selected for the GB Deaf Team for the 11th European Swimming Championships in Saransk, Russia in June 2014. Lucy, like so many Disability Sport Fife members, is a great role model for young women and in particular those with a sensory impairment. To date Lucy is one of the most successful members of the Disability Sport Fife High Performance squad. In 2012 Craig was the only Disability Sport Fife member to be selected for Team GB for the Paralympic Games, continuing a tradition of Fife representation in all GB Paralympic teams dating back to 1984. The young Dalgety Bay swimmer has raised the bar in S14 swimming in Scotland since he first burst on to scene as a pupil at Inverkeithing HS and initially as a member of Carnegie SC. Scottish National Short Course Swimming Championships – in the 50m butterfly Craig set a Scottish record. Craig has taken his excellent form of 2013 through to 2014 and turned in a number of top class performances. At the Scottish Nationals, Commonwealth Games Trials in Glasgow, Craig competed in two events and won gold medals in S14 50m and 200m freestyle. The latter was a PB, Scottish record of 02.03.05 and a nomination time for the 2014 Para-sport swimming in Glasgow 2014. Craig will learn later in the season if he has been selected for Glasgow 2014. At the 2014 British Para International Swim Meet, also in Glasgow, Craig once again competed in two events. In 100m Back Craig recorded a PB of 01.05.11, just missing out on the European Championship qualifying time by fourteen one hundredths of a second. In 200m Free Craig recorded 02.03.74, won a silver medal but just missed out on an IPC European Championships qualifying time by one second. Craig continues to excel in the S14 class north and south of the Border and he is one of a number of Fife swimmers who are in contention for a place for the Para-Sports swimming section of the 2014 Commonwealth Games in Glasgow. Craig swims with the Edinburgh University performance squad where he is coached by Chris Jones. Between 1997 and 2008 Rebecca Lee was Scotland’s most successful S14 female swimmer and a regular pick for Great Britain teams. This was a period when athletes with an intellectual impairment were excluded from the Paralympic Games following the exclusion of the Spanish basketball players at the Sydney Paralympic Games in Australia in 2000. Had that incident not happened many of the world’s leading athletes and players with a learning disability would not have been excluded from Paralympic sport and Rebecca would have been a strong candidate for Paralympic honours. Rebecca’s first GB honour was selection for the IPC European Championships in Spain in 1977 where she won two gold medals and set two world records. This was followed up by selection for the IPC World Swimming Championships in New Zealand in 1998 and 2002 plus the IPC European Swimming Championships in 1999 and 2001. A parallel international programme became available to Rebecca through the UKSA as she was selected for the INAS World Championships in January 2002 and the INAS European Championships in 2003 and INAS World Championships in 2005. Rebecca had an illustrious career and singles out the INAS World Championships of 2005 as her most successful major event. The Dalgety Bay swimmer won a total of six medals in individual events and team relays. Rebecca’s best European event was the INAS Championships in 2006 in Budapest where she won a remarkable six gold medals, one silver and two bronze. When Rebecca retired she had won over 50 international medals of which 17 were won at IPC or INAS-FID Championships. During her time she set seven world records of which two still stand. Rebecca still holds four European records, the British 200m butterfly record and the Scottish 50m butterfly record. Fife has been fortunate to have two outstanding female S14 swimmers in Tracy Wiscombe and Rebecca Lee. Rebecca was coached by Garrie Roberts for a significant period of her career in Fife and she competed for a number of clubs including Glenrothes and INCAS. In August 2014 Alison Patrick from Dunfermline became the World Champion in her class in Paratriathlon in Edmonton Canada at the ITU World Triathlon Grand Final. Alison was recruited to Paratriathlon, following a series of athletics injuries, and throughout 2014 she recorded top three finishes in major international events. In the middle of May 2014 Alison finished third at the Yokohama ITU World Paratriathlon event and at the end of the month finished one place higher at the ITU World Paratriathlon event in London. In June she finished third at the European Championships before heading to Canada for the event that firmly established her as a world star in Paratriathlon. Alison is coached by Jonathon Riall and has been a member of the World Class lottery funded British Paratriathlon squad since 2014. Alison is visually impaired and her guide athlete in 2014 was Jenny Manners. British Triathlon recruited three guides from a guide to gold campaign and during 2015 they will guide different athletes. Alison previously swum as a junior and enjoyed a very successful track career as a middle distance runner. Alison competed at international level over 1500 metres and 800 metres and won an IBSA world title over the latter distance. Alison also represented Scotland at the World Mountain Trophy as a mainstream athlete. Alison is currently preparing for the British Championships in Wales in mid May and Hazel Smith who is based in Edinburgh will be her guide. Alison has the ambition of representing Great Britain in Rio in 2016. Professionally Alison is a physiotherapist in Fife and an exceptionally talented swimmer, cyclist and athlete. If her 2014 performances are anything to go by she will realise her dream of representing GB at the 2016 Paralympic Games. Fife team win was significant and she is now preparing for her next challenge and all that this entails. Kirsty is currently being considered by Scottish Disability Sport (SDS) for inclusion in the Scottish team for the CPISRA World Games in Nottingham in August. These Games have been important to emerging Fife athletes and players in the past as they embark on a career in high performance disability sport. Kirsty Brunton from Dalgety Bay visited the Michael Woods Centre for a swim one day and by chance met Disability Sport Fife (DSF) personnel. A meeting was arranged and what followed has changed the swimming focus of Kirsty and her contribution to disability swimming in Fife. Kirsty successfully competed in her first DSF swimming championships at the beginning of March and was then selected for the Fife team for the Scottish Championships in April in Grangemouth. Kirsty’s contribution to a memorable Fife team win was significant and she is now preparing for her next challenge and all that this entails. Kirsty is currently being considered by Scottish Disability Sport (SDS) for inclusion in the Scottish team for the CPISRA World Games in Nottingham in August. These Games have been important to emerging Fife athletes and players in the past as they embark on a career in high performance disability sport. The Games involve leading athletes and players with cerebral palsy from all over the world and although there is a restriction on the range of sports on offer, swimming will be a major element. Kirsty will be presented for classification at Tollcross Leisure Centre in Glasgow prior to the mid June Performance gala organised by SDS and Scottish Swimming. Kirsty arrived in Scotland age 12 and has been swimming from an early age. As well as being a very competent swimmer she has been an RYA sailing instructor for over 20 years and involved in organising the annual youth week in Dalgety Bay for around 50 junior learners. Kirsty was Commodore at Dalgety Bay Sailing Club for two years and has been married to Chris for 9 years and they have a 5 year old daughter called Sarah. Throughout her school years Kirsty was active in team and individual sports but until two months ago had not considered competitive swimming. She is excited about joining a new Fife swimming club, teaming up with a new coach and seeing how far this will take her. Kirsty works for HMRC and left Edinburgh eight years ago to settle in Dalgety Bay. Within a very short period of time she has made a very significant contribution to Disability Sport Fife. Callum Sloan continues to progress as a wheelchair track athlete with performance potential. Participation in the 2015 London mini marathon confirmed where he currently sits within his age group in Great Britain and he cannot wait until the 2016 event. In the meantime he will continue to listen and learn from coach Pamela Robson and concentrate on recording personal best times at the Disability Sport Fife (DSF) track and field championships and other race meets around the country over the summer. Disability Sport Fife recently recognised Callum at the Annual Awards Evening by presenting him with the emerging junior award. This award recognises the young sports person who has demonstrated most progress during the season past and is one to watch for the future. Callum is very committed to track athletics but also turns his hand to swimming, fitness training and any other sports opportunities that come his way. DSF considers Callum a perfect role model for young wheelchair users. Instigated by Active Schools staff Andrew Baird and Fiona Ashton Jones, wheelchair rugby was recently offered as an option in the Sports Festival hosted by Queen Anne HS for Primary pupils moving schools after the summer. As well as celebrating the forthcoming World Cup, Callum and his fellow pupils were able to experience the wheelchair version of the game in a learning, festival environment. There was no shortage of enthusiasm, quality wheelchair handing skills and positive feedback from all participants. During the Festival de brief in the main hall, Mr Billington the Depute Headteacher of Queen Anne HS took the opportunity to present the DSF award to Callum. As well as being a very committed sports ambassador Callum devotes time to raising funds for Disability Sport Fife. The London mini marathon was a challenge in itself but Callum chose to seek sponsors for his efforts and raise around £1300 for DSF funds. The money will be used to help sustain the weekly sessions organised by DSF for participants with a physical, sensory or learning disability of all levels of ability. Kenny Suttie from Milton of Balgonie was at one time a Disability Sport Fife junior athlete with enormous performance potential as a swimmer, basketball player and wheelchair athlete. Along with team mates Derek Frew, Nicky Diatchenko, Martin McArdle and Evelyn Neave he raised the bar in wheelchair athletics in Fife and spearheaded a growth in interest in wheelchair sports across Fife. Kenny represented Scottish Schools at the European Schools Games in Lisbon and competed in a significant number of British Wheelchair Racing Association competitions and road races across the country. In 2005/2006 Kenny decided to retire from sport and concentrate on his college studies and his new life with wife Terresa. Kenny now works for Sky and has two children, aged 7 and 11. Two months ago Kenny decided to return to training and competition and he has been warmly welcomed by Disability Sport Fife. He has linked up with DSF coach David Brown and is taking advantage of the DSF seated throws sessions supported by the Leisure Trust, Scottish Athletics and REMAP. Kenny has been involved in three competitions to date in Fife, Forth Valley and Wishaw and his performances have improved across the three disciplines he contested. His personal best performances now sit at shot 7.71m, discus 21.40m and javelin 17.66m. Kenny will join forces with Michael Mellon (Cardenden), Jonny Brown (Thornton) Mary Wilson (Edinburgh) Lewis Barnett (Cupar) as the physically disabled throwers in the strong Fife team that will compete in the Scottish Disability Sport Senior Track and Field championships in Perth in September. Team Fife will compete in the Championships as defending champions and holders of the Bob Mitchell Trophy. In the last decade Team Fife has won the team trophy on six occasions with Team West of Scotland coming out on top four times. Every athlete competes for team points towards the team trophy and the return of Kenny to disability athletics is a great boost to the Fife squad. Father of three Michael Mellon from Cardenden became a member of Disability Sport Fife earlier this year and in a short period of time he has made an immense impact. Michael competed in his first DSF Track and Field Championships at Pitreavie in June and won the men’s ambulant javelin. He will be part of a strong squad of physically disabled athletes from Fife that will compete in the Scottish Disability Sport National Senior Championships in September in Perth. At school Michael was a very keen rugby player and javelin thrower and he excelled in both. Michael’s father was in the Royal Air Force and he joined up in 1997. He sustained a tibia and fibula injury playing rugby and attended Headley Court Rehabilitation hospital for a short period. In 2005 Michael was medically discharged and whilst on sick leave met his wife and they married in 2004. Because of all the leg pain he was experiencing Michael decided to progress with an amputation. In 2014 Michael signed up with Dundee Dragons and has become involved in the Dragons wheelchair rugby league team. Michael loves the camaraderie of the club and sport and values the friendships he has made through this dynamic sport. Michael was thrilled to be selected for Team Scotland and play in the Four Nations Rugby League Tournament last year. Michael is a member of Pitreavie Athletics Club where he is being coached by Gordon Loudon. He is an F44 standing thrower and hopes to introduce a cross over step in due course. Michael throws an 800 gms. javelin 37 metres plus but those who know him well believe there is more to come. Like a number of DSF members Michel plans to try out wheelchair curling over the winter. Disability Sport Fife was delighted to hear about Michael from colleagues in Tayside and he was introduced to DSF members at the DSF Annual Awards evening earlier in the year. Michael is quick to acknowledge the enormous support he has received from BLESMA and Help for Heroes. Michael is an athlete with enormous performance potential and he has been warmly welcomed to the Fife high performance Parasport squad. In 2013 while living in Kirkcaldy, Mary Wilson became a member of Disability Sport Fife. Since then she has immersed herself enthusiastically in training and competitions all over the country. Mary is now a most valued DSF member and following an excellent Fife Swimming Championships in February she helped Fife to team victory at the 2015 Scottish Swimming Championships at Grangemouth. Mary recorded similar successes at the Fife (DSF) Track and Field Championships at Pitreavie and has earned the right to represent Fife at her first Scottish (SDS) Athletics Championships in Perth in September. Mary also enjoyed success in the 2015 Grand Prix Throws circuit promoted by Scottish Athletics and is about to turn her hand to wheelchair tennis, wheelchair curling and lawn bowls. This inspirational and remarkable woman was medically discharged from the Army after 20 years service as a mental health nurse. She completed four operational tours including Bosnia, Kosovo, Northern Ireland and was the Field Mental Health Team Officer in charge in Afghanistan for three months. Unfortunately Mary had a serious shoulder injury and was diagnosed with multiple sclerosis. This led to her Services discharge. In 2013 Mary was fortunate to be selected as a swimmer for the Warrior Games and for Mary this was a life changing experience. The Games involve wounded serving personnel and veterans. Some have limbs missing or have a visual impairment and others have psychological disorders such as depression or PTSD. It was the 2013 Warrior Games that inspired Prince Harry to launch the inaugural Invictus Games in the UK in 2014. Mary was appointed captain of the GB field athletics team and went on to win bronze medals for shot and discus and won three gold, one silver and one bronze medals in swimming. This year Mary competed in the Second Warrior Games in Virginia USA and won one gold, one silver and one bronze medal in the swimming pool and set PBs in all her races. 200 athletes from the Army, Navy, Marine Corps, Air Force, US Special Operations Command and British Armed Forces participated. Mary is undoubtedly inspired by the sporting challenges and camaraderie but also being able to compete against the US military. Mary is now based in Edinburgh, working for Help for Heroes, and training with the Heart of Midlothian Masters squad. DSF is helping her to realise her sporting targets. These include access to competitions, coaching support, equipment and introductions to appropriate organisations and individuals that can assist her to pursue her sporting ambitions. Mary Wilson has become a great role model for women in sport in Fife and beyond. Early in 2015 Richard Osborn from Cowdenbeath signed up with Disability Sport Fife and within three months he made significant progress. Following his athlete induction meeting, Richard agreed to swim in the DSF swimming championships in Glenrothes and in that first swim meet it was clear he had performance potential. Qualification for the Scottish Championships at Grangemouth led to another series of fine swims and recognition that Richard had a performance swimming career ahead. Richard’s excellent swims helped Fife to a win in the team competition at the “nationals”. Richard is 27 and a diving instructor. In August 2009, an accident in Cyprus left him with a spinal paralysis at the level T6/T7. Richard is a wheelchair user and his new swimming training regime has to take account of the functional restriction he now has in his lower limbs and trunk. Every training session is about learning how to adapt but at the same time strive for perfection in stroke technique. DSF facilitated an introduction to Carnegie Swimming Club and introduced Richard to head coach John Szaranek who has agreed to coach Richard. Richard has signed up for the Scottish Disability Sport Performance Gala at Tollcross International Swimming Centre in mid June. On the same weekend he will receive a classification from British Swimming. Richard’s performance career will then be well and truly launched as he competes in his first long course swim meet against Scotland’s leading Para sport swimmers. Richard now works for ENABLE in Dysart and is keen to try other sports. Richard has already had a tennis coaching session with Alan Russell at Dunfermline Tennis Club and hopes to follow in the footsteps of fellow DSF members Brad Stewart and Graham McIntyre and try wheelchair curling. Richard has already had a spell in wheelchair basketball with Lothian Phoenix but his swimming abilities and potential have encouraged him to concentrate on the sport which has offered him so much throughout his life. DSF is proud to support Richard as a new member and help him on a sporting pathway which hopefully will assist him to meet his personal goals as a very talented sports person. Sam Fernando from Gateside and Fife AC continues to make steady progress as a T20 performance athlete and hopes one day to receive the call up for Scotland and Great Britain. The Fife teenager has recently left Bell Baxter HS to further his education as a college student. During his time at Bell Baxter Sam represented the Department for pupils with additional support needs at local and national level with great distinction in athletics, cross country and football in particular. Disability Sport Fife supported Sam through classification on his 16th birthday and he has not looked back since. In June 2013 at the Fife Schools Athletics Championships, prior to completing the international classification process, Sam ran 5:21.7 for 1500 metres and finished 5th. In June of this year at the UK Youth Development U17/U20 League Division North Premier 1 in Preston, Sam recorded 4:31.8 over the same distance to confirm how much he has progressed with support from coach Ron Morrison at Fife AC. Sam is currently ranked 8th for T20 1500 and 800 metres across all age groups and ranked 1 for 5000 metres following a personal best time at the 2015 Scottish Schools Championships of 17:04.74. Sam’s GB ranking for T20 under 17 athletes over two miles is 2 which yet again confirms the enormous potential of this young Fife teenager. Like all Fife AC athletes Sam had a busy summer of local races in 2015 and of course the Tour of Fife in July/August over five days in five different settings. Sam finished 8th overall and was first junior in the Tour. Like all successful young athletes Sam has superb family support and will head off for the first time to Bedford for the UK Age Group Championships on 29th and 30th August where he is entered for the T20 1500 metres. Another exciting opportunity ahead for the Fife teenager will be to run in Central Park New York on a forthcoming family holiday while following the training programme set down by his club coach. Fife AC is recognised by Disability Sport Fife as an outstanding inclusive athletics club. Sam Fernando is the most recent athlete to progress through the club’s coaching structure that involves inclusive coaches such as Dave Francis, Elspeth Wallace, Rachel Edger and Ron Morrison. Paralympic gold medallist Caroline Baird (nee Innes) was a product of the Fife AC performance pathway and Maurice Paterson is a current member who continues to represent Fife in disability sports events with great success. Earlier this year Sam was invited to attend a Scottish Athletics junior training camp and last year Sam was awarded the Disability Sport Fife junior athlete of the year award. Many individuals, including Bell Baxter HS PE staff member Fiona Stewart, recognised early on that Sam is a very special distance athlete and he is certainly in the best place to further develop his athletics talent. Sam ended his time at Bell Baxter HS as the Scottish Disability Sport Junior 1500 metres champion but for those who know him well, the best is yet to come. Cara Smyth was born in Kirkcaldy but has lived most of her life in Dalgety Bay. Cara joined InCAS Swimming Club when she was eight and she and her family have been very active members of the club ever since. When she was seven Cara underwent surgery on her spine which subsequently led to her having to wear a back brace for up to 20 hours a day from age 10. Similar to 2012 Paralympic swimmer Craig Rodgie, Cara is a pupil at Inverkeithing HS. Swimming has played an important role in Cara’s life because of the freedom of movement and non-weight bearing experiences she has in the water. The release from her brace for a few hours a day has helped enormously to build her strength, flexibility and of course confidence and self-esteem. Cara is a classic example of the power of sport in assisting young people to overcome physical challenges. The role of an inclusive club like InCAS in helping young people to realise their dreams and aspirations is critical. As a more senior swimmer with INCAS Cara has now turned her attention to teaching and encouraging other young people to commit to swimming. Inspired by the Commonwealth Games in Glasgow the Smyth family approached Disability Sport Fife (DSF) about the possibility of Cara becoming involved in the DSF programme. Cara is successfully coached by Garrie Roberts at INCAS and there was no need for coach support. Cara was offered access to DSF swimming galas and Scottish swimming galas where Team Fife was represented. Cara initially competed as a guest but when she was formally classified by British and Scottish Swimming as an S10/SB9/SM10 in the summer of 2015 her place as a performance disability swimmer was confirmed. Cara is now a member of the DSF performance squad and successfully competed in her first Scottish Disability Sport Performance Gala in the summer of 2015. The best news Cara has received to date was from Scottish Swimming to tell her that she has been called up for the Scottish National Junior Disability Squad and her first squad training session was in Stirling on the first weekend in October. Securing her classification and competing alongside other performance swimmers with a disability has inspired Cara to train even harder and set new goals within disability and mainstream swimming. Cara has been welcomed enthusiastically to the DSF swim squad and she has already made her mark at the Scottish Championships as a member of Team Fife. The story of Cara Smyth is yet another success for InCAS, a club that believes in inclusion and is happy to address the needs of all swimmers regardless of ability. Disability Sport Fife (DSF) is committed to encouraging and supporting participants with a physical, sensory or learning disability to achieve their full potential in sport. In March 2015, mother of two, Susanne McGrath presented herself at the DSF office in Glenrothes and asked for support to complete a wheelchair marathon before she turned 40. Time was not on Susanne’s side but her request was acted upon immediately and her sporting journey began. Age nine, Susanne was involved in a road traffic accident which resulted in spinal paralysis. The first task for DSF was to secure a racing wheelchair for Susanne and her first experience in that chair at Pitreavie Athletics Centre was an occasion to remember. Initial trepidation quickly turned to over confidence as she took full advantage of her new found freedom of movement and speed. Susanne took to her racing wheelchair very quickly and it was not long before she was balancing on two wheels. Susanne was then paired up with DSF coach Pamela Robson and young Dunfermline wheelchair athlete Callum Sloan. 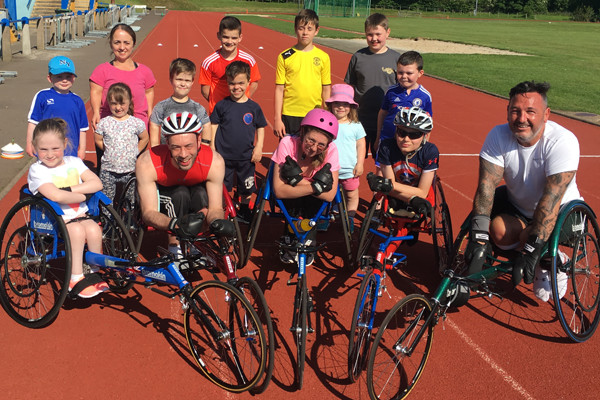 The DSF wheelchair racing group of the 80s and 90s was revived and over the past few months Susanne has gone from strength to strength with support along the way from her very committed family and in particular her father. Susanne’s first major road race challenge came in the Glenrothes Road Running Festival 4K which went according to plan. She then participated in the Fife Track and Field Championships at Pitreavie and other invitation athletics events around the country in the lead up to her first major event, the Glasgow 10K on Sunday 4 October. Training sessions in Glenrothes, Pitreavie and the Beveridge Park, Kirkcaldy have prepared Susanne well for her major challenge of 2015. The hope is that Glasgow will be another stepping stone in her quest to complete a marathon in 2016. Participation in major events like the London Marathon require wheelchair athletes to turn in performances below three and half hours for a full marathon and one hour and a half hours for a half marathon. Juggling work, family and training is always difficult but Susanne is incredibly determined and hopes to increase her weekly mileage to the recommended target recommended by Scottish Athletics wheelchair racing coach Ian Mirfin. Team DSF is behind Susanne all the way and the Thursday run/push, jump and throws session for athletes with a physical disability at Pitreavie Athletics Centre is growing by the week due to the enthusiasm and example set by Susanne and Callum. Susanne’s only regret to date is that she did not embark on an athletics career prior to 2015. Best wishes to Susanne in her first major challenge of her wheelchair racing career. In 2005 Michael Simpson from Auchtermuchty was runner up in the Strathmiglo Bowling Club singles championship and a member of the under 25 Fife County team. Vascular illness resulted in a double below knee amputation and a radical rethink of his future as a performance bowler. Following a year in hospital and with massive support from family and Strathmiglo Bowling Club friends and committee, Michael launched a career in disability bowls after leaving hospital in March 2008. The occasion was the Disability Sport Fife Championships at the Beveridge Park in Kirkcaldy in June 2008 and he has never looked back since. Michael’s progress as an international disability bowler has been impressive. The year following his first involvement in his local Championships, Michael returned to win the Fife title and in the same year he won his first SDS Scottish disability bowls title at the Westburn Park in Aberdeen. Michael then played a very significant role in the Scottish victory over England’s leading physically and visually impaired bowlers at the Beveridge Park in 2009. In 2010 he travelled with the same strong Scottish team to Nottingham for a rare indoor bowls victory over the Auld Enemy. It was a natural progression that Michael would be selected for Scotland’s physically disabled and visually impaired team to travel to South Africa for the World Championships in 2011 to try and better the third place team finish at the Championships of 2007 in Australia. After a comfortable start, the heat and humidity of South Africa took its toll on Michael in the singles, but in true Simpson form he rallied for the pairs competition and won a bronze medal with Kevin Wallace in the toughest section of the tournament. For the past couple of years Michael has been focussed on trying to gain selection for Team Scotland for the Para-Bowls triples at the Commonwealth Games in Glasgow in 2014. In the summer of 2013 at Kelvingrove in Glasgow he enhanced his chances hugely by being an integral part of the Scottish physically disabled triple that won a gold medal at the 4 Nations and then repeated the performance a few months later at the 8 Nations. That remarkable physically disabled triple included Kevin Wallace (Central) and Billy Allan (Cowdenbeath). They played 13 matches, won 10, drew 2 and lost only 1 in two major events against the world’s leading para-bowls nations. Michael Simpson is a very strong family man and Connor (one), Joshua (four) and of course wife, Lynda, play a huge part in his very busy life. Michael works for Gooch & Housego as an optical assembly technician and he combines family life with work and of course his massive commitment to bowls. Michael is quick to pay tribute to his family and everybody at Strathmiglo Bowling Club who has played such an important part in his bowls development before and after his illness. Last year Michael received support from the organisers of the Reelers Ball in North East Fife to which he is hugely appreciative. In addition he is appreciative of the role played by Disability Sport Fife, Scottish Disability Sport, Bowls Scotland and now the Scottish Institute of Sport in his development. This is a young man who has ambitions of winning a Commonwealth gold medal in Glasgow in 2014 and thereafter challenging for a place in Team Scotland for the World Championships in New Zealand in 2015. As well as many successes in disability bowls, Michael is fiercely proud of the role he played as a member of the Strathmiglo Bowling Club team that won the Fife Top 10 in 2010 and went on to finish runners up in the Scottish Top 10 in 2011. In 2005 he was proud of his runners up spot in the club championships and a very important milestone in his career was repeating that performance in 2012, four years after losing his legs. Michael Simpson is an inspiration to bowlers throughout the country and an exceptional role model to performance athletes across sports, within Disability Sport Fife. The next major challenge for Michael is gaining selection for Team Scotland for Glasgow 2014. The team training camp in Portugal between 17 and 24 March is a very important occasion for the outstanding Fife bowler who is currently in the middle of a house move to add to his challenges. Frank was first introduced to the sport of curling at age 12 on a frozen pond in Falkland in Fife. When he was 35 years of age he had an accident at work which left him paralysed and dependant on a wheelchair for everyday mobility. When wheelchair curling was introduced to Scotland, Frank embraced it with great enthusiasm. Prior to his accident he was a very skilful curler and had hopes of representative honours. Following his accident it was obvious he had retained great knowledge of the tactics of the game. During his life he was totally committed to his sport and travelled extensively as both a competitor and a tutor. In January 2005 Frank was awarded the International Paralympic Committee award for "Athlete of the Month". This is one of the most prestigious honours in international sport and the winner is judged against fellow athletes from all sports across the international community. This was not only a great honour for Frank and those closest to him, but also Scottish curling. Frank excelled as the skip of Scottish and British teams that in a short period of time achieved so much at International level. His first World Championship involvement in 2002 resulted in a bronze medal in Switzerland for the Scottish team. In 2003, on home soil, he won silver at the International Bonspiel. A return to Switzerland in 2004 brought Scotland’s first World Championship title. This was followed up by a magnificent retention of the title on home soil at the 2005 Championships at Braehead. His greatest achievement was as skip to the GB team that won silver at the Winter Paralympics in Torino. Prior to leading the Scottish team to major honours Frank received the "Sportsmanship Award" at the World Championships of 2002 and the Bonspiel of 2003. Frank was highly respected by his fellow players, coaches and volunteers alike. Frank was a wonderful ambassador for the sport and led teams well and contributed so much to the development of the sport both nationally and internationally. Frank retired from competitive curling in 2006 and became actively involved in the development of the sport thereafter until his untimely death in 2010. Ann Swann from Methil was a double Paralympian who represented Great Britain at the Games in New York in 1984 and Seoul in 1988. Throughout the early 80's she represented Scotland at European and World Championship events organised by CP-ISRA. Ann excelled as a CP2 athlete but also achieved considerable success in swimming and boccia. The Paralympic Games in New York in 1984 was an occasion for Ann to remember. She won 3 gold medals in field athletics and established herself as one of the leading athletes in her class in the World. Ann retired from competitive sport after the Games in Seoul in 1988 but her contribution to the development of disability sport in Scotland was immense during the 80s. Ann helped to raise the profile of sport for athletes with high support needs. From 1992 to 2006 Lara Ferguson was the outstanding Scottish female swimmer with a physical disability in the open class events in Scotland. Lara attended Leslie Primary and Glenwood High School and she learned to swim at the Fife Sports Institute. In 1992 Lara joined Glenrothes Swimming Club and in 1999 moved to Incas. At school Lara also became an accomplished table tennis player and won the Scottish singles and doubles title partnered by her Leslie team mate Paul Noble. Lara’s first major international was the Paralympic Games in Atlanta in 1996 and she followed that up with selection for Sydney in 2000 and Athens in 2004. In Sydney Lara won bronze in the S9 100 metres breaststroke and silver in the 4x100 metres medley relay. Lara also won many medals at IPC European and World Championships. Lara was an outstandingly successful junior swimmer who progressed through to the senior ranks and became a great Paralympian in the toughest of the IPC Swimming classes. Lara was still involved in Masters swimming in 2014. Martin Hunter is one of a number of physically disabled and sensory impaired bowlers in Fife who have made their mark in international lawn bowls during 2013. Martin is a member of the Scottish disability bowls squad and was one of a number of high performance bowlers in consideration for the Para-Sport bowls competition at the Commonwealth Games in Glasgow in 2014. Martin has enjoyed an outstanding season at club and international level. Within his mainstream Burntisland club, Martin won the club’s singles and mixed pairs titles during the season past. He rounded off a wonderful year by winning the club nomination pairs title. Martin continued his record in the Disability Sport Fife open championships by winning the singles title at the Beveridge Park in Kirkcaldy and going on to the National Championships in Aberdeen where he reached the semi-finals. Martin greatest success in disability bowls came last summer when he was a member of the Team Scotland squad that won a triples gold medal at the 4 Nations Championships at Kelvingrove, the venue for Para-Sport bowls at the Commonwealth Games 2014. Success in the 4 Nations earned him selection for Scotland’s ‘B’ triples team for the 8 Nations Championships, also at Kelvingrove in Glasgow. Included in that 8 Nations competition were reigning world champions South Africa and past world champions Australia. Martin was a member of the Scottish triple that won the bronze medal in this most prestigious event. The success of the Scottish bowlers has given an enormous boost to Scotland’s chances for the Para - Sport bowls title at the Commonwealth Games in 2014. Martin has had an outstanding season as a mainstream and physically disabled bowler. Martin is a very committed sportsman and a fierce competitor. In a short period of time in disability sport as a member of the Disability Sport Fife High Performance squad, Martin has made a very significant contribution to disability bowls in Scotland. Stefan Hoggan from Auchtermuchty enjoyed a very successful 10 year competitive disability swimming career. Disappointment at not being selected for the Commonwealth Games in Glasgow prompted a change of focus and the young Disability Sport Fife swimmer has enthusiastically seized the exceptional opportunities that came his way in 2015. Stefan was invited by British Triathlon to attend a Talent ID weekend in Loughborough. This led to an invitation to attend a British Triathlon training camp in Lanzarote for two weeks. Once again Stefan made an impression and he was invited by the governing body to attend a three month funded camp at Loughborough. With support from his employers Rowlands Pharmacy from Kinross, Stefan has taken full advantage of the training opportunity and committed himself totally to becoming a GB international. In preparation for the British Championships in Wales in mid May 2015, Stefan completed his first Paratriathlon in the PT4 class in Leicester. On this occasion the swim was indoors and unfortunately he swam an extra two lengths to record 6.29 for 450 metres. Stefan hopes to swim around 5.30 for the actual 400 metres distance. Stefan then covered the 20K cycle in 36.13 and his 5K run in 19.13 with 40 metre transitions under one minute for an overall time of 1.03.46. Stefan was pleased with his 4th overall age group finish and 16th position overall of 200 competitors. Stefan is coached by Alistair Donaldson of British Triathlon and now that Paratriathlon is on the Paralympic timetable for Rio he has set his heart on doing all that he can to challenge for a place in Team GB. As well receiving support from British Triathlon, Stefan is grateful to Stuart Wilson of Specsavers for support with contact lenses and East Fife Tri club for providing his first triathlon suit. Stefan turned in another excellent performance at the British Championships in Wales where he finished fourth in his class. British Triathlon confirmed its faith in him as a serious contender for Team GB for Rio in 2016 and retained him on the GB squad for a further 12 months. If Stefan continues to progress as he has he may very well achieve his ambition of one day representing Team GB. 15 year old Ollie Carter from Cupar and District Swimming Club has been awarded the Bill Pullar Bursary for 2015. The Bell Baxter HS pupil was voted the outstanding male swimmer at the 2014 Scottish Junior Swimming Championships and under the guidance of club coach Mark Laing he improves with every meet. Mark is complimentary about Ollie’s commitment to training and how he has become a true student of the sport. At the 2015 Scottish National Championships at Tollcross Aquatics Centre in Glasgow, Ollie made it through to the finals on every day of the Championships. Ollie’s two major successes were winning gold in 400 metres freestyle in 4.43.44 and securing bronze in 100 metres butterfly in 1.18.60. In 200 metres IM, Ollie was 5th overall in 2.43,82 and in 100 metres freestyle he swam 1.02.05 in the final. Currently coach Mark believes Ollie’s strongest event is 400 metres freestyle and the Glasgow swim confirms that this is the case. The Bill Pullar Bursary is awarded each year to the athlete, player or coach identified as most deserving of funding at a critical stage of their performance career. The Busary is administered by Disability Sport Fife on behalf of Margaret Pullar whose late husband Bill was the architect of the Fife Sports Institute and a great supporter of DSF. The Institute was the birthplace of DSF and the centre where many Fife disabled sports’ participants started their careers and progressed to international successes. Ollie accesses strength and conditioning training in Glenrothes at the new centre with support from Stuart Bazzari of the Fife Sports and Leisure Trust. The Bill Pullar Bursary is awarded annually and past recipients have been Owen Miller, Craig Rodgie, Derek Rae, Stefan Hoggan and Brad Stewart who have all gone on to GB level within their specific sport.